I'm on my period and having urticaria,it seems like I'm allergic to something I ate yesterday. I couldn't even sleep last night coz it's itchy all over my body. 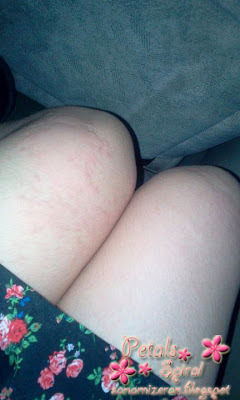 This is how my skin looks like when I have urticaria. So ugly I feel like having a 3D map of the world on my body!! I went to a hospital nearly my parents's office at about 8.30 and had to wait for the doctor for about 30 mins.Not so long anyway,since it's a private hospital. She told me that one could got urticaria when her body is weak either she's allergic to something.I guess it was because I'm having my period so my body is kidda weak coz I don't remember that I'm allergic to anything but who knows?It might be something I ate like my parents said. 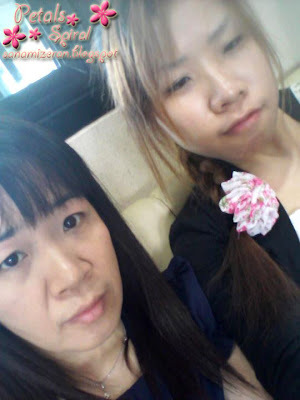 I took some pic with my mom who accompanied me to the hospital also since I don't really have so much chance to take pic with her. I really look sleepy on this pic and yeah,I'm actually SOOO sleepy. I didn't use any makeup today since it could be allergic to my skin,you can even see a scar on my right eyebrow.It can't be seen in the most of my pic coz of the makeup. 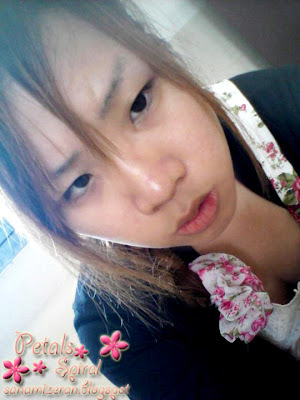 And...sorry for annoyed face,I was really sleepy anyway. I woke up around 5 p.m. seems like my skin looks better after I took the medicine. Oh,and by the way,today there're some replies to the jobs I had applied for. I hope I could get a job really soon.